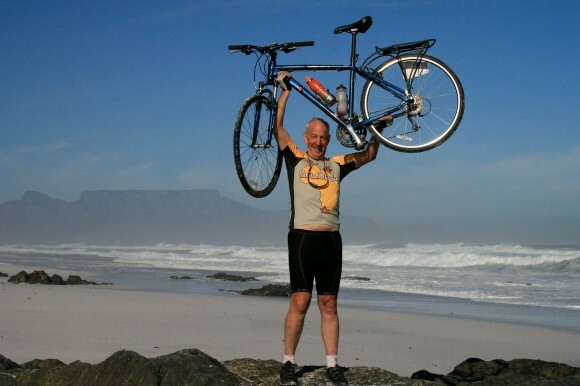 Kelowna surgeon Dr. Bill Nelems on the beach near Cape Town, South Africa, after cycling 4,500 kms across southern Africa earlier this year. Dr. Nelems will be speaking about his adventure at the Oct. 1 fund-raising barbecue and social at UBC's Okanagan campus. A barbecue dinner and social will be held at UBC's Okanagan campus on Friday, October 1, to help raise awareness for local initiatives aimed at improving healthcare in Zambia and Ghana. The afternoon and evening event is hosted by the School of Nursing, in partnership with Okanagan Zambian Health Initiative Group (OkaZHI) and the campus-based Project GROW (Ghana Rural Opportunities for Women). "Globetrotters, bike enthusiasts, and anyone else who is interested in learning more about the work that our nursing students and our community partners are doing to create sustainable healthcare in some of Africa's poorest regions are encouraged to come out to this fun evening full of food, culture, stories and networking opportunities," says Joan Bassett-Smith, Associate Professor in the School of Nursing. After an informal dinner -- a traditional African barbecue called Braii -- Dr. Bill Nelems, a Kelowna-based thoracic surgeon and founder of OkaZHI, will share stories, photos and memories from his recent 4,500 kilometre, five-week bike ride across Malawi, Zambia, Botswana, Namibia and South Africa. Nursing students will also present slide shows highlighting their co-op experiences in Zambia and Ghana, as well as with Project GROW -- a campus initiative that works to improve the health and educational opportunities of rural women and their families in Ghana. "Every year, 20 to 30 fourth-year Bachelor of Science in Nursing (BSN) students go to Africa to work with Ghanaian nurse practitioner graduates in hospitals, community placements and rural and remote clinics," says Fay Karp, Associate Professor of the School of Nursing. "They bring with them medications, paediatric equipment, laptop computers, books, and school supplies." Nursing students pay for the trips themselves, hosting a variety of fundraising events on and off campus throughout the academic year to help subsidize costs. "In a very short time OkaZHI and UBC nursing students have accomplished a great deal in relation to sustainable health care," says Karp. "This event gives us an opportunity to increase awareness about health needs in Ghana and Zambia, as well as showcase the student experience. Community support is essential to our success, and we think it’s important to provide our community with the opportunity to see how donations have been used, and the impact they've had on people's lives." The School of Nursing Braii and Social takes place 4:30 to 8:30 p.m., Friday, Oct. 1, in the University Centre ballroom (UNC 200). Tickets are $10 at the door. For more information contact Fay Karp at fay.karp@ubc.ca.